Learn if you qualify. 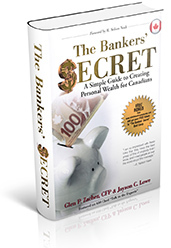 Meet the authors of “The Bankers’ Secret – A Simple Guide to Creating Personal Wealth for Canadians”. Get a complimentary debt analysis. Quick debt relief begins at McGuire Financial, let’s get started. 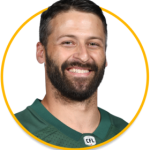 What does the quarterback for the Edmonton Eskimos want you to know about McGuire Financial? Discover the amazing benefits of a PAR Policy. Pay down debt. Create a retirement paycheque. 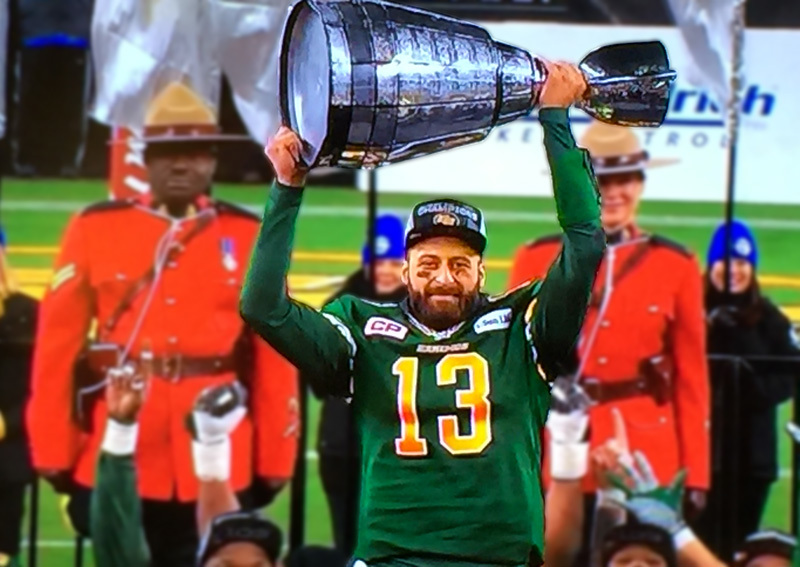 When It Comes to His Financial Future, Mike Reilly Doesn’t Mess Around! 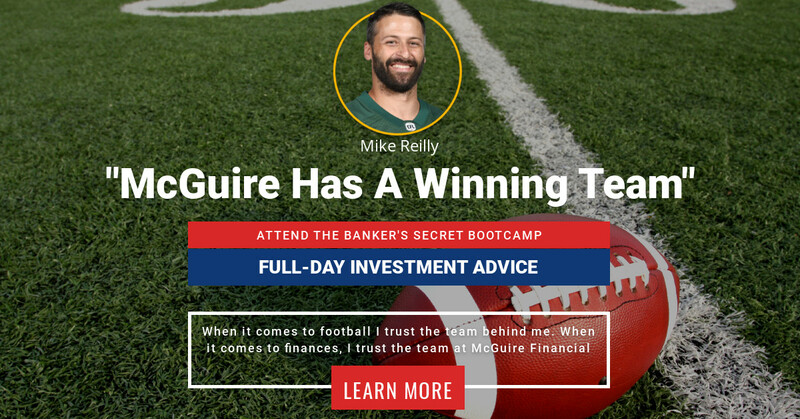 Do what Mike Reilly does and book some time with the pros at McGuire Financial. Don’t let the defensive line sack your finances. Just like Mike’s pro playbook, your financial playbook needs to be written by the experts at McGuire. Register Today to Master Your Finances! To schedule your complimentary 2nd opinion, please fill out this quick form, submit it and then choose a time that works for you from the calendar. Learn how you can beat the bank… by becoming the bank! In Canada, we have been brainwashed to believe we NEED the bank. As sure as death and taxes, we’ve become complacent into believing that it’s absolutely normal to give up hundreds of thousands of dollars (some in the millions) to the bank over our lifetime. You Don’t need the bank. The Bank NEEDS YOU! For example: Most financial advisors in places like Edmonton and Calgary (or across Canada) will want to help you build your wealth and security through traditional models of investing such as RRSP’s, stocks, bonds and/or outdated models. However, this type of traditional investing is no longer fresh, current, or relevant. If “traditional” models of investing are not necessarily working well for you, perhaps it time to discover how YOU can be the bank, grow and nurture your wealth so you can build your legacy moving forward. Based on the best selling book and wealth building system, “The Infinite Banking Concept” by financial expert R. Nelson Nash, we’ve helped hundreds of people learn, implement and build wealth through smart and revolutionary banking concepts. We at McGuire Financial are not “traditional” financial advisors. Traditional methods get traditional results. However, if you’d like to learn better wealth strategies, and stop making your bank the rich recipient of your hard work, you may be curious to learn how YOU could be the bank. 3 HUGE Key Money Management Lessons from Edmonton’s leading Financial Advisors. You hear this from the rich and wealthy. You read it in Fortune Magazine. You’ll read it in autobiographies of the wealthy. You’ll hear it from us too. “You could choose to be a lemming for the bank. Or you could be the Bank! The wealthy choose the latter” Glen P. Zacher, CFP Radio Personality & co- author of “The Bankers’ Secret”. It is not a “get rich quick scheme!” Do you have what it takes to become your own banker? Do you have a need for the use of Money? Are you an individual or Family that are earning income and fed up with giving it all to the bank? Are you an established business professional? Are you a middle or high income earner: i.e: dentist, lawyer, educator, doctor, engineer, real estate investor, etc? Are you the owner of an established small or medium sized business (1 million in revenue or more)? If you answer YES to any of the above, you likely qualify. Let us show you a system where you can recapture the principal and interest you pay on big purchases. If we could do that would you want to discover more about it? It’s simple really. Everybody banks. In fact, banks count on it. Let’s take your child as an example. Let’s imagine your child celebrated his/her 19th birthday this year. Your teenager’s account at the TD Bank has matured into a student account. It went from a “free account” to a “fee for service account”. Your teen started actively generating revenue for the bank with his/her first job. And you can bet that your child is worth A LOT of money to the bank over his/her lifetime. If your kids stay loyal to the TD Bank over the next 34 years of their life, he/she will earn the bank a BIG FORTUNE. Your teen will deposit his/her salary, and the bank will earn thousands in fees over the next 30 years. Cha-Ching! The bank will lend your kids money for a car, tuition and perhaps down the line, even a mortgage. The bank will earn hundreds of thousands of dollars more off of your kids through earned fees which include interest, transaction costs, statement costs, and so on. Cha-Ching! And the bank will UPSELL your family at every turn. The bank will make sure that they earn revenue generated from non-interest income sources including fees, commissions and other sales off of Adrian, including mortgage insurance, travel insurance, e-transfer fees, and future digital services such as virtual security services. So, what is your family worth to a bank? If your child becomes a successful professional and earns over 150K a year by the time they reach their mid 30’s, your offspring will be worth hundreds of thousands of dollars (if not millions) to the bank. How much are YOU worth to the bank? If we take all of your bank costs, fees, commissions, and interest to determine the average annual profit the bank earns from you and your family we can determine the customer lifetime value (CLV) for the bank. You too are probably worth hundreds of thousands of dollars to the bank! It feels wrong doesn’t it? Why should we make the bank rich? What if we could help you BEAT THE BANK by Becoming the Bank? The Banker’s Secret Bootcamp is a full-day intensive money management training that helps you discover how you can be exactly like the top 10% of families in Canada who leverage their income power to be the bank and BEAT THE BANK! How YOU can recover all of the principle & interest you pay to finance vehicles and other large purchases. How YOU can grow your money on a foundation of contractual guarantees! How YOU can do this on a tax-advantaged basis. How YOU can borrow your money and continue to grow your money at the same time! As a Financial Advisor in Alberta, we often ask our top clients to take 60 seconds and do a quick addition. You can do this right now. Add up all the payments you have paid on everything you have ever owned. This is all the money that has left your life and entered the bank’s life as payments. Now add up all the liquid money you have in your individual retirement account. Which number is bigger? Most of the time, it is the bank’s by a huge exasperating margin. And that leads us to helping you discover the bankers’ secret! How to take your own capital (all at once or built up over time), make your own loans to yourself (and your loved ones), and create payments back to yourself. How the wealthy deal with wealth. The answer is inside a correctly designed __________________ (secret sauce) that affords you many benefits. Your biggest wins will be from your ability to grow your money tax-advantaged even when you borrow the money out of your ____ _______ (secret sauce). How to loan yourself money & pay yourself interest, free up that cash to be used again as you pay yourself back, and growing a pool of money that should always be used as your family bank. REGISTER FOR THE BANKERS’ SECRET BOOTCAMP NOW! You’ve got to hear some of these testimonials from attendees! Hurry now and reserve your seat in the next training. Seating is limited. You’ll network with quality people. Lunch will be provided. And you’ll learn life-altering money management processes from several Financial Advisors and Money Management professionals from our McGuire Financial team. If you are unsure if you qualify for this training, choose a time that works for you and book your 15 minute appointment with one of our Financial Advisors. If you qualify, reserve your seat now (link to purchase). Buy one, second person is 50% off. When you purchase a ticket to one of our Bankers’ Secret Bootcamps, our promise to you is that we will share our best high-value business intelligence to help you earn more, retain more, and enable you to leave a larger legacy to your loved ones. This training is 100% information on “How to Become Your Own Bank”. There is no selling. If you want to work with us after this training, you will need to make a private appointment with a McGuire Financial team member to see if you qualify. Our purchase guarantee: If you are unhappy with the high level of training or quality of information shared with you during the training, we guarantee a 100% refund, no questions asked. ARE YOU INTERESTED IN ATTENDING ONE OF OUR UPCOMING BANKERS’ SECRET BOOTCAMPS? McGuire Financial created The Bankers’ Secret (based on the USA version of the Infinite Banking Concept) in 2008. The necessity to create a Canadian version of this concept was born. This is a time-tested financial strategy that allows high income earners to grow their money safely and predictably, even when traditional investment strategies like mutual funds, stocks, and other investments under-perform. It’s a way for you to become your own banker. You become your own source of financing along with its tax advantages. The Bankers’ Secret gives you the ability to loan yourself money, free up that cash to be used again as you pay yourself back, and maintain a pool of money that should always be used as your family bank. The Bankers’ Secret is a process that will allow you to recapture depreciation on big-ticket items like cars. This structure will allow you to borrow money quickly without having to jump through hoops for credit approval. Let’s face it. Banks are good to you when times are good. But when you need the money, they are no longer friendly. This way, allows you to be in control of your outcome without having to explain to a bank employee why they should lend you money. Imagine you having a way to recapturing all the payments you are now giving to a bank. What if we can show you a way to redirect those payments back to an insurance policy that grows tax free and guaranteed. Corporations, celebrities, families from “old money”, and the wealthy have been doing this a long time. We’ve taken this concept to serve business owners, medical professionals, investors, families that come from “new money”, educators, middle and high income owners in Canada. As financial advisors, we don’t recommend this for everyone. You need to qualify and be of a certain income. We can help you determine if you qualify. Simply book your 15 minute appointment with one of our Bankers’ Secret professionals, and we’ll help you determine if you qualify. Tell Me EXACTLY how this works. For those of you that are analytical and reading every word , we know you require ALL the data and proof to make sure you should invest your time with us, and that your time is well spent. What you will learn in the 1-Day Bootcamp is how to leverage a Participating Dividend- Paying Whole Life Policy. You will need to commit one day to learn EXACTLY how to do this. Being your own banker takes more than a generous income. You’ll need the right information. You’ll be required to apply the information correctly. In fact, we’ll need a minimum of eight hours of your valuable time to transfer the business intelligence to you. This is why we have developed a 1-Day Bankers’ Secret Bootcamp. Okay. We know some of you have VERY busy lives and prefer a 1 hour private meeting with one of our Executive Financial Advisors. No worries. Call our office to get started: 780-462-1289 Edmonton main office or 403-538-6898 (Calgary) or Toll Free 1-877-364-8204. Have a look at our calendar to determine which time is best for you. Create an appointment with an Infinite Banking Expert and Discover How You Too Can Become Your Own Banker. Here is a scenario: You have 3 credit cards. First major credit card is maxed out. Second credit card is getting up there. You have taxes you are behind on. You are only paying down interest now, and have no means to tackle the principal. You are feel its getting tight and you have no breathing room. If you keep only paying the interest, things will not get better. Try to negotiate new terms with each creditor. Don’t ignore or avoid them. For example, if you owe 10K on MasterCard, see if you can negotiate a 3K payment and close the card. Discuss how this will affect your credit rating. If you can’t negotiate on your own, you may need us. If you do, we can help you. If you own a home, you can remortgage your home and bundle the debt into your mortgage. Make a list of everything you owe. If you don’t know where you are starting at, in terms of exactly what you owe, you’ll end up in a bad place. Best to face your fears and know your numbers. To be the CEO of your life, you always need to know your numbers. The bank will send someone to your home to evaluate the house and see what the maximum loan they can issue you. They will ask for your tax returns. They want to know if you could manage the loan they are about to issue you. The good news is, in most cases, your payment will end up being much more manageable then paying off the interest on all your high interest credit cards. Note of caution: If you are successful in re-mortgaging your house, the chances of you ending up in the same place (owing high debt) is very likely. It will take some self-discipline from you to change your money management blueprint. In other words, you’ll have to change the way you do things if you want a different result. If you need help with your money management or your financial planning, we can help. With 30 years of experience as Financial Advisors, we never judge you for where you are at now. You could have suffered from a job loss, from a divorce, from illness, or a bad economy. This happens to many good people. Our job is to move the needle on your dreams. Our goal is to help you create a new money blueprint that drives you from where you are now, to where you’d like to be. Though it sometimes feel like a black hole of debt, all is not lost. There is an actual strategy where we can help you pay off your debt, rebuild your credit score, and get you in a good place. Push here to download a Pre-Qualifying Form. If you have over ten thousand dollars of debt, you may qualify. Return via email. Once we receive your Pre-Qualifying form, a Financial Debt Solutions Professional will set up a 15 minute phone Interview to better understand your circumstances. If you qualify, we will then set up an in-person meeting at our office. This is where our team presents our recommendations based on your specific situation. Everyone is different. Our job is to advocate for you. If you choose McGuire Debt Solutions as your advocate, we will then set up a second meeting. This is where you bring all your bills and documentation. We complete your file and set an agenda to bring your file to a resolution. Our job is negotiate the best repayment schedule for your debt. While any repayment program will negatively affect your credit score short term, our job is to help you learn how rebuild your credit. We start immediately. You’ll be surprised to learn how fast you can be back on track. If you have been declined for a re-mortgage by a traditional bank, we have a relationship with mortgage brokers who will go shopping with secondary lenders who are used to dealing with high risk. We also have a network of private lenders if traditional channels don’t work. If you know you are at a point of no return and debt consolidation is no longer an option, we can help you declare bankruptcy. The best advice we can give you as a financial advisor, is to stop delaying the unavoidable. It’s like ripping off a band-aid. The quicker we do this, the less pain you will feel. The truth is, you may find this to be the win-win you need right now. Don’t feel bad. Whatever situation, or circumstances that propelled you to this tight spot, it may be helped. Let’s begin working towards your new outcome and what you wish to create in your life. There is always freedom to be found in starting a new. 1st Step: Download this no-obligation application and let’s start a conversation. There is no fee for your first 15 minute appointment. There is no fee for your first interview. It’s our job to see if you qualify and if we can help with your debt consolidation. Remember, we are here to serve you and be your advocate. Whatever situation or circumstance you have lived through, our job is to help you move the needle on this. You’ll feel 100% lighter by taking action. We can stop the countless intrusive calls, lighten your stress, and help you sleep at night. More importantly, we can help put you back on track in more ways than simply helping you with debt consolidation. Nobody likes debt. Would you be willing to talk with one of our Debt Consolidation Experts? Schedule a time that works for you and we’ll talk about it. During the next few weeks we will be giving away some great prizes on air! *programming changes happen. Show can air at 12:00 pm without notice. Be one of the first 5 people when you hear play to win! Try to claim your prize. Fill in your ballot to win meet the experts grand prize! * You will have a selection of dates available. Limited seating in Edmonton and Calgary. Listeners can qualify to win a prize OR win a prize every 60 days. If a listener qualifies for a major prize (i.e. – grand prize), they are not eligible for another 60 days to qualify again or win a prize. If a listener or a member of their household wins a prize, they cannot qualify to win a prize or win a prize for another 60 days. 60 days – no exceptions. How do I call in to win? Your prize can be redeemed by calling the office. One of our staff members may contact you to help you choose the dates of your training. The prizes are absolutely free to you. However, a credit card will be required to reserve your seat. You will NOT be charged if you honor your commitment to attend. However, once you reserve your seat, your lunches have been ordered, your training manuals have been prepared, and our staff has worked hard to make your experience a great one. If you are a “no show”, your credit card will be charged $97.00 per person confirmed under your name. There is absolutely NO charges if you attend the seminar. How do I pick up my prizes? I can’t attend available training dates. Can you ship my prize? A shipping fee of $47 plus taxes will cover the handling and shipping. What Do I Need to Bring if I pick up my prize? You need to bring one piece of photo identification (e.g. Driver’s Licence, Passport). Can My Friend Pick Up My Prize? Someone else can pick up your prize as long as they have a legible photocopy of your ID, and a note from you stating that you permit them to pick up your prize. However, please make arrangements with our receptionist before doing so. What is your prize policy? Listeners can qualify to win a prize OR win a prize every 60 days. If a listener qualifies for a major prize (i.e. – trip), they are not eligible for another 60 days to qualify again or win a prize. If a listener or a member of their household wins a prize, they cannot qualify to win a prize or win a prize for another 60 days. 60 days – no exceptions. PRIZE VALUE: Prize values may vary. Prizes may not be redeemed for CASH. How Do I Enter Online To Win? Simple listen to the radio show, then fill out the “Enter to Win” form on this web page.